Even strong players make bad moves. Sometimes, they make really bad moves. To win a chess game, it’s generally not necessary to play perfectly. It’s not even necessary to play well, as long as you play better than your opponent. There are numerous reasons for blunders. Lack of theoretical knowledge or the inability or unwillingness to calculate properly can explain some errors. Time trouble is a common culprit for many players. 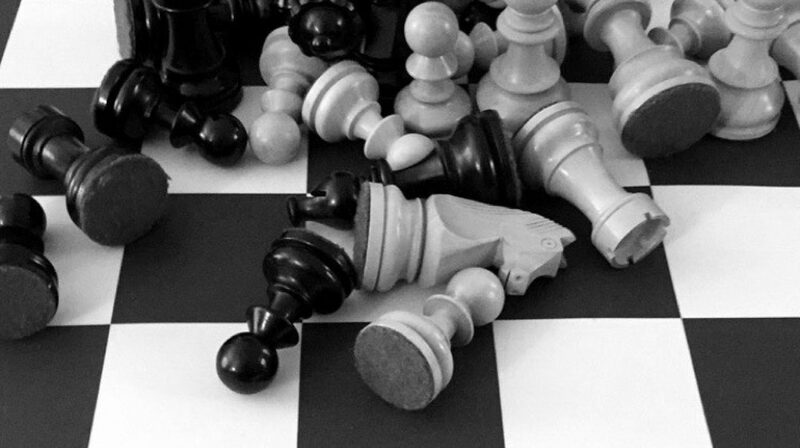 Bad positions often lead to blunders, as it can be difficult to find the best moves when under pressure on the board. The combination of pressure on the board and on the clock can often cause players to commit serious oversights. On the other hand, mistakes in good positions can come from letting one’s guard down. Assuming that “anything wins” or that accuracy is not required can result in throwing away half or even whole points. Sometimes, both players share a blind spot or make offsetting mistakes. In the following endgame, my grandmaster opponent essentially gave me half a point, only for me to throw it back a few moves later. We had just made the time control and my prospects looked pretty bleak. I could hardly imagine the way this game would go from here. 41. Nb5 This seemed like the best practical chance, even if it’s objectively not a good move. I figured that I would just lose slowly if I didn’t try something drastic. axb5 42. cxb5 g5 43. b6 Na6 An incredible blunder in an easily won position. 43… f5 44. b7 f4+ 45. Kf3 Na6 with an easy win. 44. 51. Kc7 Here’s the answering mistake! The spectators who had gathered by this point seemed to think afterwards that 51. Ka6 was the way to go, and in fact it seems to lead to a draw. Even with an extra queen, Black can’t win. Qe2+ (or 51… Qf8 52. b8=Q Qxb8 is stalemate! This is the point I missed during the game. I thought he could maneuver his queen to c7 with my king on a6 but this trick bails me out even in that situation.) 52. Ka7 Qe3+ (or 52… Kf7 53. b8=Q Qe7+ 54. Ka8 g4 55. Qb1 Qd8+ 56. Kb7 Qe7+ 57. Ka8 the queen ending is okay for White.) 53. Ka8 g4 54. a6 Kf7 55. b8=Q g3 56. a7 g2 57. Qc7+ Qe7 58. Kb8 Again, the queen ending is okay for White.) 51… Qc5+ 52. Kd7 Qb5+ 53. Kc8 Qa6 54. Kc7 Qxa5+ and Black won. In the following game, I made a serious error in the late opening/early middlegame, but was not punished by my opponent. I went on to obtain a nice advantage, lost most of it, and then converted the ending when my opponent did not find the right way to continue. Virginia Chess League. 1. d4 Nf6 2. c4 c5 3. d5 e6 4. Nc3 exd5 5. cxd5 d6 6.
e4 g6 7. Nf3 Bg7 8. Nd2 O-O 9. Be2 Re8 10. O-O Nbd7 11. a4 Ne5 12. Ra3 a6 13.
should still be better. (18… Nxe3 19. Rxe3 Bb5 20. Rfe1 Qf6 21. Nc4 h4 22. 22. Nxd6 Rd4 23. Rf3 Rxd5 24. Bf4 (24. Nxf7 Rf8 25. Nh6+ Bxh6 26. Bxh6 Rxf3 27. 38. h4 Kh7 39. Ne4 Bd4 40. Re1 Bxb3 41. Rb1 Bc2 42. Rxb4 Bxe4 43. fxe4 Bc3 44. Ra4 Be1+ 45. Kf3 Bxh4 with two extra pawns.) 36. Bxe5 fxe5 37. Nc4 Rf7 38. 41. Kf4 Rf2+ 42. Kg4 Ra2 43. Re5 Rg2+ 44. Kf4 Rb2 45. Rc5 Rxb3 46. Rxc6 Rb1 47.
probably simpler and stronger to play h6 and keep the h-pawn on the board. 47… h6 48. Ne6+ Kb5 49. Kd3 Kxa5 50. Nd4 Bd5 51. Kc2 Kb6) 48. Ne6+ Kb5 49. The final game I will show features many reciprocal errors. Some of them can be explained by the clock situation, some by not remembering endgame theory, and some for which I really have no good explanation. In one critical position, I fell for a simple trick and lost a piece by thinking I’d seen further and just missing my opponent’s follow-up. example: Nf8 20. Bb6 Qc6 21. f5 gxf5 22. Ne3 f4 23. Nf5 Nxf5 24. gxf5 e3 25. Rxf4 Black’s probably just winning here with an extra pawn and strong bishops. Bc8 25. Re3 Rxf4) 25. Re3 Ned5 26. Nxb7 Nxe3 27. Nxe3 Bxc3+ 28. Kxc3 Nxe2+ 29. 32. Kxc3 A terrible oversight, based on a simple miscalculation. mainly thanks to Black’s poor queenside structure.) 34… Re1 35. Rf2 Nxh4 36. Still missing Ra8+! (76. Ra8+ Kh7 77. Ra7+ Kg8 78. Rd7 Rg2 79. Ke6 Re2+ 80.
is another standard winning idea.) 76… Rf2+ 77. Kg6 Rg2+ 78. Kf6 Rf2+ 79. 85. Be5 Rh1 86. Bf4+ Kh7 87. Rf6 Rh5 88. Bd2 Rh2 89. Bg5 Rh3 90. Rf2 Kh8 91.
seem to have these positions rotated like this!) 85… Ra6+ 86. Kf5 Ra2 87.
game ended up being something of a comedy of errors, especially in the endgame. Still, there’s plenty one could learn from a close examination of such a game. What should we conclude? We’re all going to make mistakes over the board, but so will our opponents. So hang in there!